Welcome to my outdoor and BBQ recipes site. Visit my recipe list for the complete list of smoked foods. My smoked meats recipes will be changing indefinitely as I plan to improve existing recipes and add new ones on a continual basis. 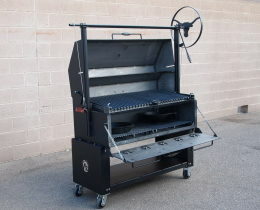 Whether you are new to smoking meats or you are a seasoned veteran, I hope to provide a little something for everyone. All recipes within this site will contain detailed preparation instructions and video shot in HD to clearly demonstrate the specific tips and techniques I used to smoke the meats. Be sure and stop in frequently and browse the smoking meats recipes. All new recipes will be tagged with “New Smoke” labels so you can quickly navigate to the recipes of interest. Remember… Cooking times will vary so always use a thermometer. Cooking on Cast Iron is a new genre to my site. 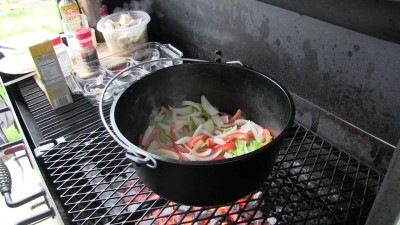 Keep coming back as I will be adding more cast iron skillet, wok, griddle and Dutch oven cooks. All of which will have details and HD video. Cast iron cooking recipes at their best! 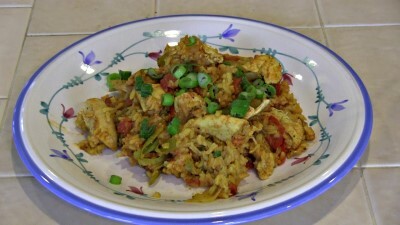 Arroz Con Pollo is one of my favorite Mexican/Cuban dishes. It means yellow rice and chicken. The yellow color comes from the Turmeric. 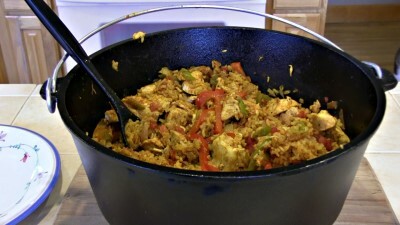 This was my first attempt at making this dish in a Dutch oven and it could not have turned out better. We are going to start by washing and trimming 3 lbs. of boneless chicken breast. Once trimmed then begin slicing the chicken into chicken fingers and then cut those up into large chunks. Place in a bowl and place in the fridge. Next cut up the vegetables. Open and de-seed the red bell peppers. Slice the red bell peppers into long strips. When done place them into a bowl for later. Open and de-seed the Anaheim peppers. 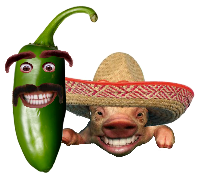 Cut the Anaheim peppers into smaller chunks. Place them in the bowl with the red bell peppers. Slice a yellow onion into wide pieces. This is easily done by slicing from top down from the center and keep working your way around the onion. Next cut the bottom off and it will fall apart into nice sized pieces. Please see my video. Next mince or chop 4 large cloves of garlic. Place the garlic into a small spice bowl or plastic bag. Measure out the following spices and place each in its own small spice bowl or plastic bag. The containers are just to make it easier to add all the contents as you cook. You won't have time to measure as you cook. Measure and pour 3 cups chicken broth into a large cup. Measure and pour 2 cups long grain white rice into a cup. Open a 14.5 oz. can of diced tomatoes with green chili's. Measure 1/4 cup of tomato paste and place it into a small spice bowl. 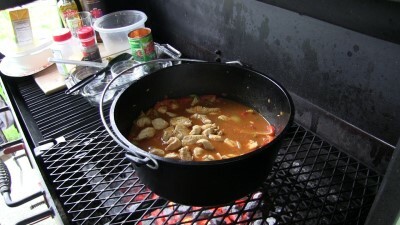 Place all the ingredients including the chicken by your Dutch oven and cook area. Now its time to cook. 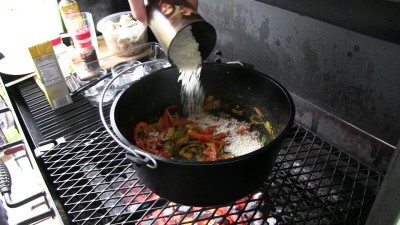 Place 8 hot briquettes under your Dutch oven. Once the lid goes on you will place 17 hot briquettes on top to achieve baking @ 350 degrees. 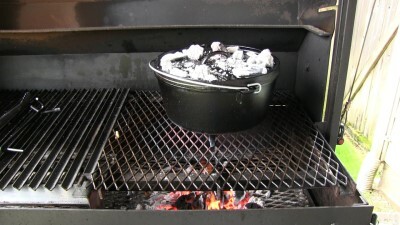 Start with your Dutch oven 5"-6" above the hot coals. 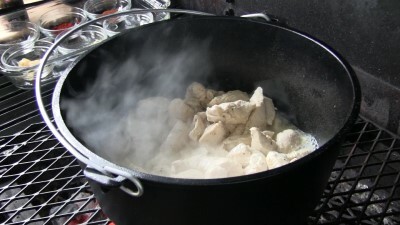 Once the lid goes on, raise the Dutch oven to about 10" above the hot coals and place about 12 hot coals on top. Once the Dutch oven heats up add 3 tbsp. extra virgin olive oil. Once the oil is hot add the 3 lbs. of chicken. Cook the chicken until its browned. Remove the chicken and set it aside. If the bottom of the Dutch oven is dry add a couple tbsp. of oil. In my cook there was plenty of chicken juice left in the bottom. Add the onion and peppers and cook until they become translucent. Add in the garlic and Turmeric. Thoroughly mix the Turmeric into the vegies. This is what gives this dish its yellow color. Thoroughly mix these spices in with the vegies. Add 1/4 cup tomato paste. Add 3 cups long grained white rise. Thoroughly mix the rise in so it picks up the yellow color from the Turmeric. Add one 14.5 oz. can of diced tomatoes with green chili. Thoroughly mix the tomatoes in. Add the browned chicken. Using a spoon, push the chicken under the liquid but make sure that it remains on top. You want the veggies and rice to remain under the chicken for the duration of the cook. Place the lid on and place the proper amount of hot coals or briquettes on top as mentioned above. We are aiming at baking @ 350 degrees for 30 minutes. Once the meal has cooked for 30 minutes remove the lid and stir. The rice should be sticky yet the grains should pull away from each other. The chicken should be fork tender. Plate it up and garnish with chives and serve. This is a very easy cook and the flavors are wonderful.